I like the whole facility. The staff was accommodating. They have all kinds of things like classes, library, outings, a nice patio, and a meeting area. Oakmont of Escondido Hills had a lot of things to offer. Oakmont of Escondido Hills was very nice, and new. It's very clean, and it seemed as though they have the staffing there to take care of the people. They had a library. The rooms were pretty nice, but a little small but probably good for the type of situation that they're trying to handle. The staff at Oakmont of Escondido Hills was extremely friendly. They greeted us and when we were walking around, you could see them talking with the residents. When my mom got tired of walking, the girl giving us the tour got her a wheelchair and helped her upstairs. The genuine care is very interesting; it was pretty obvious. When we first walked in, there were a lot of residents in chairs either sleeping or drooling or slouching, and they didn’t look like they were happy. They looked bored; there wasn't any interaction with each other happening. The only thing that I didn’t like for the memory unit was like a time served for when the patients get up at night, and they weren’t located in an area where they could be notified right away because of where they were set up in the room; if the patient were to fall they wouldn’t notice or they won’t know. Probably more caregivers and clearer as far as what they are going to charge as the patient declines. The grounds were very pretty, so that would be the standout of it. Oakmont of Escondido Hills was a newer facility, really nice, large, and had lots of activities. They had monthly events. They gave me a cherry pie, which is my favorite dessert. The price was right in the middle. It wasn't too high, wasn't low, but it was very reasonable for what they offered. Out of all the directors that we spoke to, I felt like they really cared. They had exercise classes and art classes, and they do special events, like a farm day in the summer, animals come, out and they do a petting zoo. They also do family events where they have an open house where the families can come and enjoy. They do a circus day and fun things that are enjoyable for everybody. They're perfect. If I were to put my mom anywhere, that would be the place we would take her to. Everyone was friendly and cared. The part that struck us the best on Oakmont of Escondido Hills was the remodeling that they had just completed. It was very attractive, very bright, and cheery. That was very, very nice. They didn’t have anyone that wasn’t friendly and helpful. It seemed like they had very happy and content people. The dining room was very similar to all dining rooms. The food was very good, but it wasn’t exceptional. The rooms were larger than any of the others. The only reason we didn’t consider this as the main one was simply because it seemed like there were too many people there. However, I would recommend this facility. Oakmont of Escondido was great. That was really a nice place. It was beautiful. It was absolutely gorgeous. The grounds were fantastic. They had a lot of staff. I really liked the marketing person. I would highly recommend it. They had spacious room. It was clean and very nice. They had all kinds of activities. However, it was expensive. Oakmont was referred by a friend. The staff is very welcoming, accommodating, and with good attitude. The rooms are clean and spacious. They have Bingo and art activity going on. They have security. My parents are at Oakmont at Escondido. Their staff is great and friendly. The food is delicious. They also have activities. I was rather depressed with Oakmont of Escondido Hills because there were so many wheelchairs and walkers outside the dining room and that turned me off. I didn't know in the beginning that I would be looking at more of assisted care people rather than independent. The food was excellent and very good though. The rooms seemed to be a little bit bigger and a little bit newer-looking. Everyone there has been very nice and friendly to me and my son. My visit at Oakmont of Escondido Hills was fine. The people were friendly and welcoming, they showed us around, and answered all my questions. The rooms are very nice, they're just at the higher end of our budget. The place looked nice and was kept up nicely. They showed us the library, they have a place to watch movies, dining facilities, and they have a swimming pool too. The staff member was nice, friendly, and prompt. I absolutely loved Oakmont of Escondido Hills. Everything was great. It was nice and clean. I like the fact that it is assisted living and independent living all in one. I love the marketing director, too. She did a fabulous job. The food was delicious. They do your laundry, change your sheets, take care of your medication and appointments, and serve three meals a day included. Oakmont of Escondido Hills was a much smaller facility than others we saw as far as number of residents and space. It’s very well kept and very clean, but some of the rooms were extremely small. The gal who gave us the tour was very capable and did a very good job at explaining things. At the point where my friend was feeling very nervous about it, she allayed his fears and helped him. It seemed like their food and restaurant areas were very nice. We have another friend who has beed a resident there for three years and is doing really well, so I can say that it’s a good facility. It’s more isolated and not in walking distance to any shopping or restaurants. They had a shuttle bus, though, that takes people to appointments and shopping. There were two separate, small dining rooms. I think that they schedule people to come at certain times so they don’t have to wait in line to be seated. I visited Oakmont of Escondido Hills. The food was excellent, and I liked the grounds and the facilities. Because it was a newer facility, I just saw a model room, which was very nice. Depending on the orientation of the windows, my wall decorations will serve to make the room feel more like home. The dining room was fine and very open. We saw the independent living cottages at Oakmont of Escondido Hills. It was fine, just a little bit old. It was like a little, spacious townhouse. It looked like it was kept up nicely even though it was older. It had good ADA accessibilities, and I thought it would be good for my parents. I think they had a beauty salon and bingo, other activities, and a pool. We went to Oakmont of Escondido Hills. My experience was really good. The surroundings were beautiful. The staff was friendly. They had all kinds of exercise programs and art programs. They had a library. They are really nice. It even had a pool. It was beautiful. It was very lush and green. I've been to Oakmont of Escondido Hills four times, and every time they have an event, they're kind enough to call us to come and take part. The people were very friendly. I asked two ladies who were residents there what they liked best about Oakmont, and at the same time they said everything, so that was pretty impressive. The place was clean and beautiful. We like it a lot. It is very eye appealing with beautiful grounds, a courtyard, and nice wide aisles. I like the rooms. We had eaten there, and the food was very good. Coming up next Thursday, it's going to be a four-course meal and a casino night. It has been established, and it's been there for a while. Oakmont is good but it's not feasible for my mom. The rooms are very nice. Everything is nice. It's very institution-like. If they are healthy and independent, Oakmont will be good. The living facility in Oakmont was really nice. The condo were very large. The staff and their grounds were also very nice. Oakmont of Escondido Hills is a lovely retirement community situated on a lush six-acre campus with lovely views of the Escondido Hills, and is within walking distance of Westfield’s North County Fair Shopping Mall. If an active lifestyle is what you desire, you’ll feel at home in our retirement community where friends and neighbors enjoy our spa, private movie theater, swimming pool, and lovely grounds. If you ever need additional care, we offer assisted living and memory care services right within our community. Experience for yourself what makes this extraordinary senior living community one where life just gets better and better. 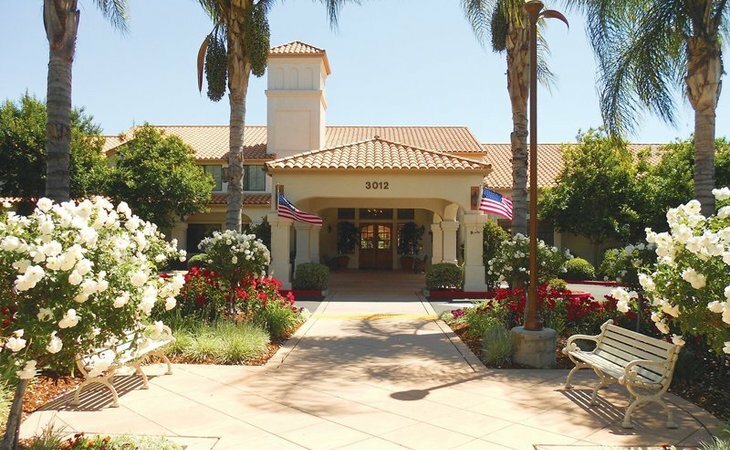 What should caregivers and potential residents know about Oakmont of Escondido Hills?